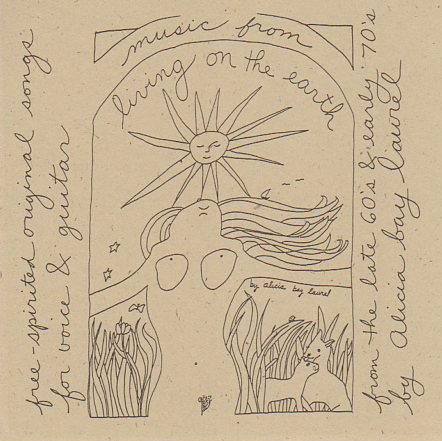 Posted on March 19, 2007 by Alicia Bay Laurel	in Blog. March 17, 2007. 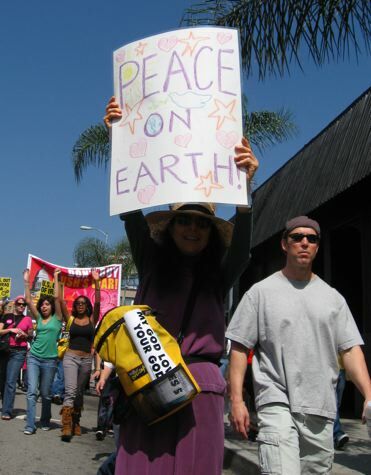 I join about ten thousand people at Hollywood Boulevard and Vine Street in Los Angeles to rally and march for peace. 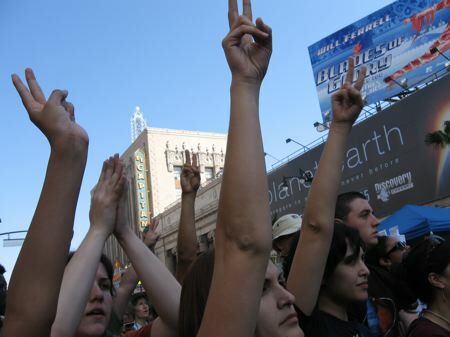 Foremost in our intentions is to stop funding the Iraq War and bring home the troops, but, clearly, most of us demonstrators see this war as only part of a larger war of the military-industrial complex and the super-rich upon the poor and middleclass of all nations, and upon the environment. We march for social justice and sustainability all over the planet. 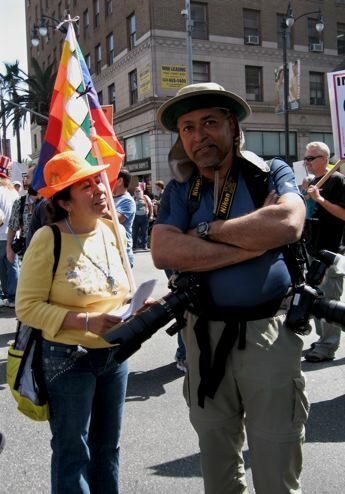 Dr. William Hooks, M.D., a radiologist from Rancho Cucamonga, was working for the day as a documentary photojournalist for ANSWER Coalition, the organizers of the march. He is talking with an indigenous Bolivian woman, who is leafletting to gather support for President Evo Morales and the Bolivian solidarity movement. 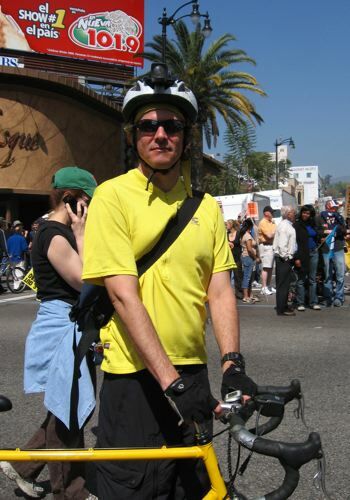 Eric Howard, who I met at Kim Cooper and Richard Schave’s wedding last June, showed up on his bike. 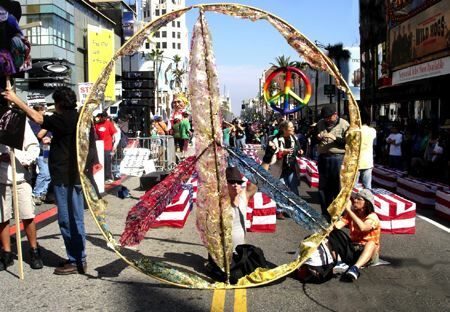 Stephen Gary welded and painted this beautiful, large peace symbol, titled Dreamcatcher Peacewheel. One very small counter-protest of Christian Fundamentalists appeared at the opening rally, but, otherwise, the world smiled upon our march. 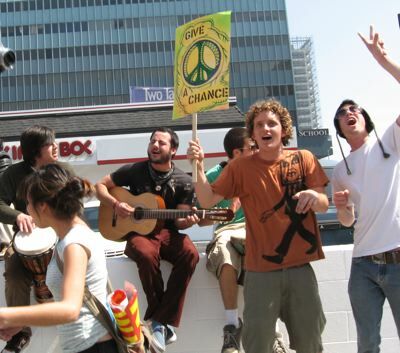 A group of young men sang and played “Give Peace a Chance,” and a group of young women began dancing in the street. 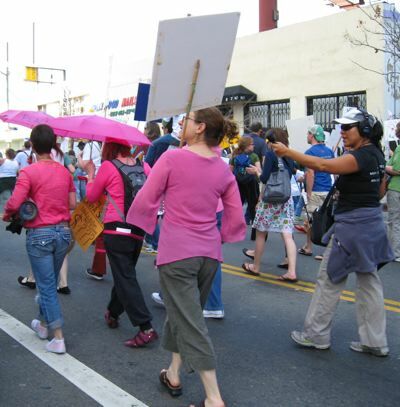 This, in turn, got the women marching with Code Pink to sing and drum “Give Peace a Chance,” and a woman from KPFK walked beside them, recording them for a program. I carried my usual handmade sign with its positive message, and some of artist Stephanie Farago’s famous bumperstickers “My God Loves Your God,” which I bestowed upon anyone who spoke to me admiringly of them. 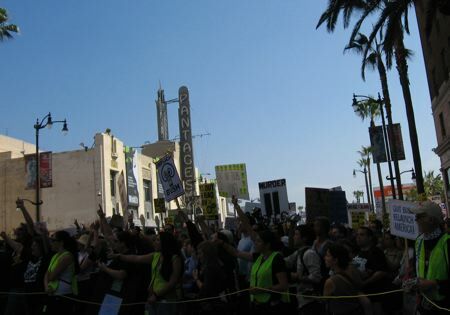 We walked to Hollywood Boulevard and Highland Avenue, where we attended a rally at an outdoor stage in front of the famous Grauman’s Chinese Theatre. 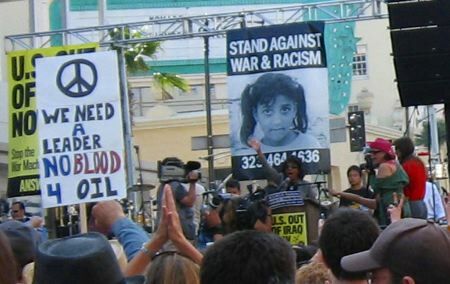 US Congressional Representative Maxine Waters, founder of the Out of Iraq Caucus, exhorted us to call, email and fax our congressional representatives and tell them not to approve the Pelosi/Murtha plan with its huge supplemental budget for the war. We roared our approval and support. After Rep. Waters, actor Martin Sheen spoke, thundering like God Himself, and after him, actresses Mimi Kennedy (representing Progressive Democrats of America) and Laura Dern. 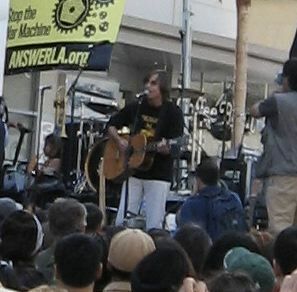 Next, the legendary singer/songwriter Jackson Browne, a mainstay at events of this sort, performed two of his protest songs, the second one with two singers who also performed later with the band Ozomatli. 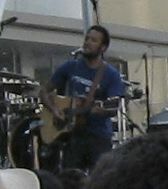 Singer/songwriter Ben Harper, eerily recalling a young Richie Havens singing at peace marches during the Vietnam War, who also performed his own protest songs. Ozomatli, a Grammy Award winning band from Los Angeles, played an entire set. It seems as if all of the band members play more than one instrument, sing, and even dance a bit, and they change roles to perform in a variety of ethnic styles, sometimes within one song: salsa, rap, Arabic, hiphop, and mariachi. 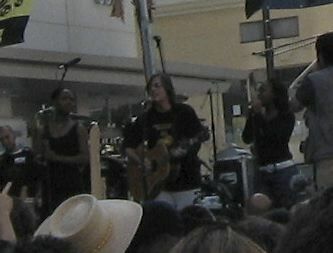 Jackson Browne joined them on the last song of their set. 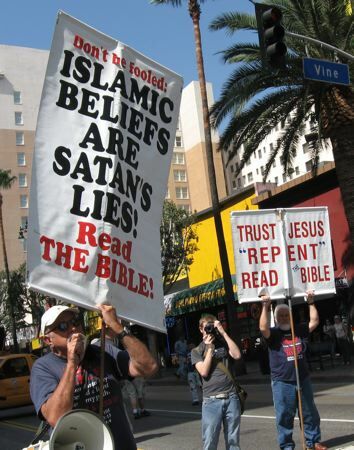 The demonstrators signalled their solidarity. Next, Iraq Veterans Against the War spoke. The Gabriela Network, a feminist group based in the Philipines, protests in particular the effect of war on women and girls, in the form of abductions and rapes, and prostitution surrounding army bases in third world countries. 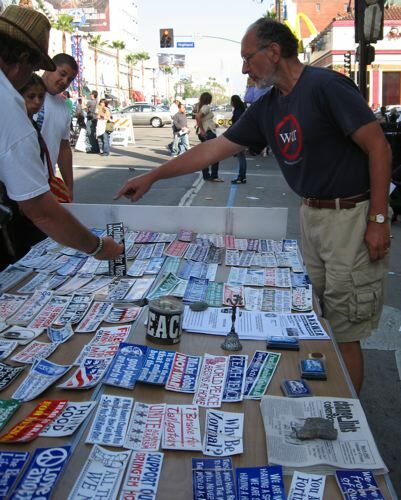 Jerry Rubin, not the Yippie social activist (who died in 1994), sells political bumper stickers most weekends near the Santa Monica Promenade, and he was on Hollywood Boulevard for the peace march. 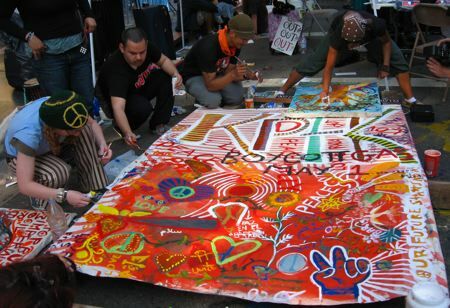 Pacifica Radio station KPFK, the voice of the left in LA for nearly five decades, had a canvas available for painting at the their booth, to advertise a day of boycotting gasoline on May 1. 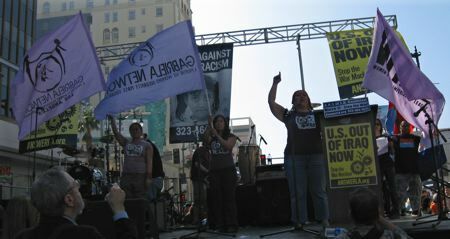 Here’s a slide show of all 51 of my photos from the demonstration!